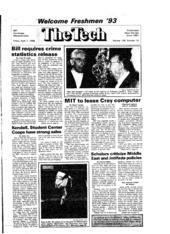 The MIT women's softball team won three of eight games at the 1989 Rebel Spring Games in Florida. MIT defeated Wheaton 11-6, Elmhurst 11-10, and Cardinal Stritch College 7-6. The Engineers lost their first game to Carthage 6-5. The teams started out evenly; both scored one run in the first inning. Carthage picked up another run in the second which MIT matched at the top of the third. Co-captain Teri Lowenstein '89 walked and then came in after the Carthage pitcher threw three wild pitches. Carthage regained the lead in the bottom of the inning, scoring twice. Once again, MIT took the lead in the top of the fifth when six players walked and the pitcher committed an error, making the score 5-4. Carthage fought back, however, and scored two runs in the bottom of the inning to win the game 6-5. MIT made some strong defensive plays in the second game, keeping Plymouth scoreless for the first three innings, but lost 8-0. "We need some stronger hitting," Lowenstein explained. "A lot of the players get singles, but we don't have anyone who hits it over the fence this year." MIT won its third game, against Wheaton, 11-6. Both teams scored one run in the first inning, but then the Engineers took advantage of seven walks and several hits to score ten runs, making the score 11-1. MIT kept its defense tight, behind pitcher Lynn Albers '92, to hold off Wheaton. Wheaton made a slight comeback in the fifth inning, before co-captain Diane DiMassa G threw out two batters from her third base position to end the inning. The Engineers lost their next two games against Luther (5-0) and University of Wisconsin at Whitewater (7-1). MIT did, however, get strong defensive playing by DiMassa, Caiti Crawford '92, and Stephanie Ragucci '90. "Caiti has an arm like a cannon, and Stephanie can get the ball no matter where we throw it to her at first base," DiMassa said. The Engineers came back to win their next game 11-10 against Elmhurst. MIT started off the game by throwing out the first two batters and then striking out the third batter. "Our pitchers really pitched well," MIT Coach Jean Heiney said of Albers and Lynn Johnson '92. "They had a good fast pace, kept them in the strike zone, and didn't walk many people." MIT started off the bottom of the inning with singles by Lowenstein and DiMassa. Four base on balls and a sacrifice fly by Cecelia Warpinsky '90 contributed six first inning runs. The Engineers held Elmhurst scoreless at the top of the second inning before scoring five more runs to stretch their lead to 11-0. Elmhurst scored four runs in the third inning and six more in the fourth, but MIT refused to give up the game. MIT fought hard, but lost its next game to Fordham 6-0. The highlight of the defensive play was when catcher Michelle Duso '91 threw out an attempted steal to second. MIT won the last game, against Cardinal Stritch, 7-6. Cardinal Stritch started off strong, getting two quick runs. Albers ended the inning with a strikeout. Cardinal Stritch held the 2-0 lead until the fourth inning; Warpinsky reached first on a fielder's choice, then advanced on a single by Ragucci. A bunt from Kim Germain '90 brought her home. Cardinal Stritch answered with two more runs in the top of the fifth, but the rally was cut short when Duso threw out another attempted steal and Albers threw out the next batter. MIT came back to tie the game in the bottom of the inning. Lisa Johnson '92 started off the inning with a triple in left-center field. Singles by Crawford and Warpinsky and three walks brought in three runs. Cardinal Stritch regained the lead in the top of the sixth to make the score 6-4, but MIT came back in the bottom to win 7-6. DiMassa, Crawford, Warpinsky, and Ragucci all singled before Germain hit a double in right field to tie the game. Duso finally singled in the winning run. MIT ended the tournament 3-8, their second best record so far for the Rebel Games. "We expect to have a good season," Heiney said. "We have two really good pitchers this year and the rest of the defense is really strong." Lowenstein added, "We worked out some of the kinks at the tournament, so now we're ready for the season."